Our Core Christian Values are: Love, Respect, Friendship and Trust. Remember to keep checking Class Dojo to monitor your points, see pictures of what has been happening in our class and for any important messages or information. Don't forget homework handed out Thursday for the following Tuesday. The Coronation of King Kevin. King Kevin, receiving news of his coronation, as King of St Peter's for the day. King Kevin during his coronation, making his way to his throne. King Kevin and his retinue. To end our Creative Curriculum theme we all dressed as our own Super Heroes or Villains . What a fantastic effort everyone went to. Here we are looking at a uniform jacket. Did it belong to a hero or a villain? We checked all the pockets and in the lining of the sleeve and found many objects. Ask the children what they found. Savita Prajipati came in to visit us. She brought many articles for us to look at and experience to help us to understand Hinduism a little more. It enabled us to question her and to be able to compare our faith with that of hers. We did some paper engineering to create a diva. 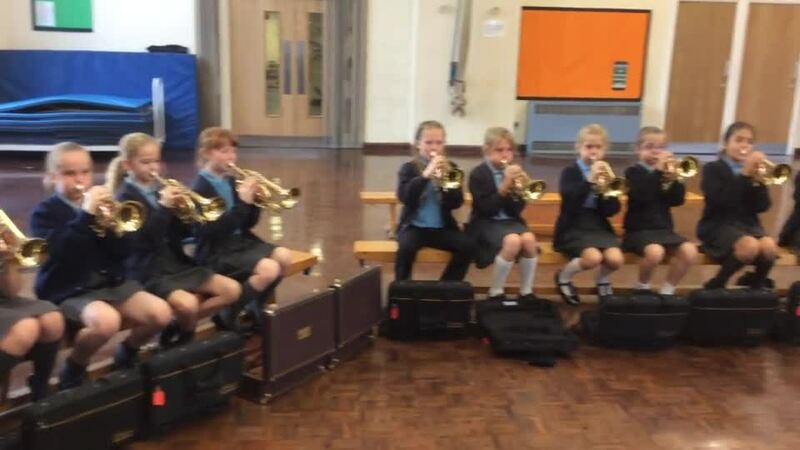 Our first brass lesson. Cornet section. Following instructions from a leader whilst blind folded to achieve a goal. Can we work together to hook a cube? Creative Curriculum, Heroes and Villains - just who are the villains?